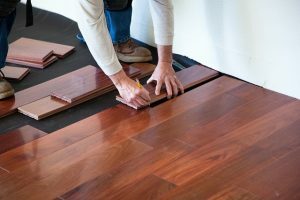 Three Ways to Improve the Appearance of Your Hardwood Floor | Mahogany, Inc.
Utilizing hardwood flooring in your home is a practical choice. Even though investing in a hardwood floor has many benefits, just like with any surface, it wear and tear occurs. Utilizing hardwood flooring in your home is a practical choice. Hardwood is easy to clean and maintain. After some time, a carpet can easily become dirty and show proof of high-traffic especially if you have children, pets, or tend to have large gatherings in your home. Hardwood is also visually appealing because of its glossy and sleek appearance. Even though investing in a hardwood floor has many benefits, just like with any surface, it wear and tear occurs. If you’re a homeowner with a hardwood floor or may be considering upgrading your carpet to hardwood, then keep reading for tips on how to improve the appearance of a hardwood floor. If you feel that your hardwood floor has lost its luster, then you can invest in a procedure called “refinishing.” Refinishing is a term simply meaning that you replace the wood that currently comprises your flooring. While cost-efficient, this task is not easy to execute, so it’s best to call a professional. We pride ourselves in providing expert wood restoration service. We are also known for our architectural millwork. However, if you find this to be a home improvement project that you can perform yourself, here are a few tips. Refinishing will require removing everything from the room, sanding your hardwood floor, and then vacuuming the hardwood floor. After this step, wipe up the remains with a tack cloth and then use a roller with a long handle to apply the new finish. Another option is using a stain or polyurethane top-coat. Assess your floor and make sure that you need refinishing undeniably. This task is one that takes patience and time. Using a new coat on top of your hardwood floor is called recoating. When we think of nails, people add a topcoat to make their appearance glossier. The same process goes for your hardwood floor. It costs less money to recoat a hardwood floor because you aren’t replace anything. Just be mindful that recoating also helps with aesthetics. It doesn’t fix the sublayer. To apply a new coating, use a hardwood cleaner, sand the wood down with fine sandpaper, and make sure that your floor is dust-free before and not wet when you apply the finish. Use a wood marker to color in and remove fine scratches. A wax crayon can also help. For deeper scratches, use sanded wood putty that matches the color of your floor. This entry was posted on Thursday, April 11th, 2019	at 3:17 pm	and is filed under Hardwood	. You can follow any responses to this entry through the RSS 2.0	feed. Both comments and pings are currently closed.